Illinois gubernatorial candidate J.B. Pritzker stands with his Illinois gubernatorial Lieutenant Governor candidate Juliana Stratton as he speaks to reporters after sitting with high school students during a round table discussion at a creative workspace for women on October 1, 2018 in Chicago, Illinois. Pritzker and Stratton was joined by former Secretary of State Hillary Clinton as they spoke to students about leadership. 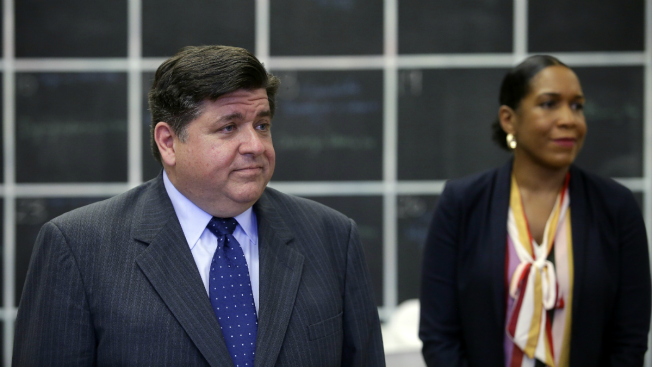 With less than three weeks to go before Election Day, 10 black and Latino staffers for Democratic candidate for Illinois governor J.B. Pritzker filed a civil lawsuit against his campaign on Tuesday alleging repeated racial discrimination and harassment. The staffers claimed in the lawsuit that most minority employees of the campaign were "herded into race-specific positions" and "received less favorable treatment than their white counterparts" while allegedly enduring "overt and invidious racial discrimination." Pritzker denied the claims in a statement Wednesday morning, saying, "To be clear, this is just not true." "I am incredibly proud of our campaign, how diverse it is, and how inclusive our administration will be," he continued, with his running mate state Rep. Juliana Stratton, who is black, adding that the allegations were "baseless" and "offensive." Stratton also claimed in the statement that, before filing the suit, the staffers' attorneys sent the campaign a letter requesting $7.5 million in damages as a settlement offer. The lawsuit claimed that the "vast majority" of black and Latino staffers were placed in field regions covering the West, South and Far South Sides of Chicago. The staffers alleged that minority organizers were denied resources afforded to their white counterparts, and claimed that they were asked "on the basis of their race, to perform racists (sic) tasks such as to, 'go round up 40 Black guys' for an event." The staffers also allege that one of Pritzker's field offices on the city's South Side was located "in an unsafe location," next to a store that was robbed twice in one week and where a woman was "raped outside their back door" in broad daylight, according to the lawsuit. A field organizer identified as Kasmine Calhoun claimed that she was the only black organizer sent to Peoria and alleged that told she was hired to "meet a 'black female organizer quota,'" the lawsuit reads. The lawsuit alleged she was "supposed to be housed with a family that was friendly to the campaign" while in Peoria, but she said that when they found out she was black they did not let her stay in their home, forcing her to sleep in her car and at the office until she was put up in a hotel in an "unsafe part of town." Calhoun resigned her position after a request to move to a safer location was denied, the lawsuit reads. One other plaintiff in the suit also resigned while eight of the 10 staffers named still work on the campaign. "I am very proud of the campaign that J.B. and I have put together," Stratton said. "The majority of our senior team are African American and almost 45 percent of our entire staff are people of color. When people feel like they have been harassed or discriminated against, they have the right to come forward and have their voices heard." "In this case, we had a letter delivered to us asking for $7.5 million dollars in 24 hours or they threatened legal action and to go to the press. That’s not a good faith effort," she continued. A Pritzker spokeswoman provided a portion of what the campaign claimed to be a letter from the plaintiffs' attorneys, appearing to request the money as well as other terms that included the hiring of a "chief diversity officer" and the creation of an anti-discrimination policy as well as mandatory employee training, plus a personalized letter of recommendation from the campaign for each staffer. The letter appeared to come from Samuels & Associates law firm, which did not immediately respond to request for comment. The portion of the letter that Pritzker's campaign released did not have a date, but appeared to include a line warning that the "settlement offer expires" on Oct. 8. Stratton said in her statement that the "incidents listed in this complaint are baseless and make offensive claims in regard to several members of our staff. We stand by our staff and that’s why we are not afraid to litigate this to the fullest extent of the law. I couldn’t be prouder to be on the ticket with JB and of the statewide, grassroots campaign that we’ve built."